In addition to eating delicious food at Seattle’s VegFest, we met humans who actively support a healthy life for all. Since the editor in chief of the American Journal of Cardiology informed us long ago that we are indeed herbivores (and that we need to eat as such to save ourselves from disease), and since climate scientists informed us that we need to stop consuming animals and animal products (in order to save the planet), what could be a better cause to actively support than this? 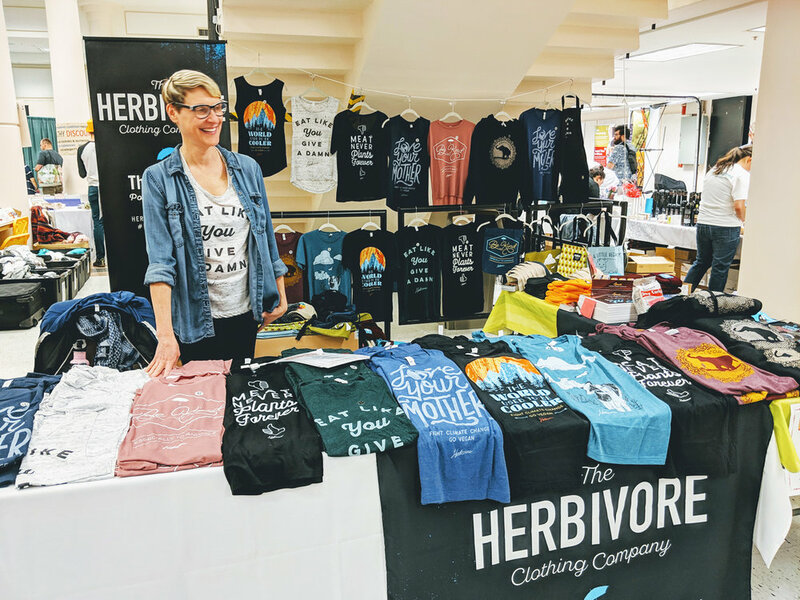 The Herbivore Clothing Company came all the way up from Portland, OR, to help make this gentle activism possible. Heartwood Haven also makes this gentle activism possible. It’s so wonderful that Gig Harbor is represented by such a kind educational rescue organization. Heartwood Haven even has a short documentary. I’d never before heard of Animals Asia. One look at their website shows their impressive work, most notably saving bears from the bile industry. I’m so grateful that Animals Asia came all the way to Seattle VegFest, to gently educate all. VegSeattle.com also appeared at VegFest. Their online Seattle Veg Restaurant Directory allows anyone to take gentle activism steps (by simply choosing to eat at a veg restaurant). And this small activism step is perfect: how to get more vegan food at Starbucks. This message by Compassion Over Killing was placed on a table. I’m thinking it would make a terrific billboard. I have a hard time condoning violence of any kind, yet I know when we can no longer restrain a perpetrator from harming a helpless being, we sometimes have to use stronger force to keep the perpetrator off of the innocent. There’s nothing easy about this. For those who have the strength to watch, Sea Shepherd has been at this a long time. I’ve been told their YouTube station is something to check out, too. They were so kind at VegFest (and they completely understood my inability to watch them at work, on the water). 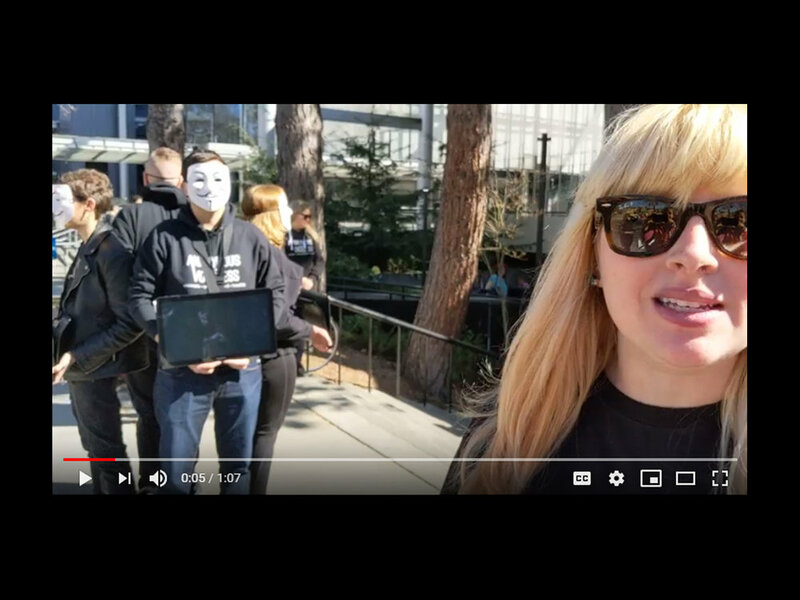 Then, just as we were leaving Seattle VegFest, we were so grateful to witness Anonymous for the Voiceless compassionately educating as they so beautifully do. They helped vegetarians see the importance of veganism. They helped plant-based see the importance of thinking beyond food. And they reminded me why I’m trying so hard now to avoid any items made from a being who was harmed. I thank them so much for granting this live interview, on the spot. I’m humbled by who is speaking and I’m humbled by those who are displaying that which we need to see, so we can help make this world a safe place for all.